"Manaku Teliyani MS", the translation into Telugu by reputed Telugu writer Volga of TJS George’s book on Subbulakshmi, published by Hyderabad Book Trust was inaugurated on 24 Nov 2017 at Lamakaan, Banjara Hills. Renowned Carnatic musician TM Krishna spoke on this occasion. Krishna’s reported question, whether MS would have been as adored if she was dark-skinned and dressed differently, has hit a raw nerve. Carnatic musician TM Krishna is never one to shy away from controversy. His outspoken emphasis on the caste equations of Carnatic classical music, and the larger question of Tamil culture, has often attracted both shining praise and vociferous denouncements. But never have his views received more outrage than his November 24 speech organised by Manthan and the Hyderabad Book Trust in Hyderabad on Carnatic legend MS Subbulakshmi. A report by Deccan Chronicle on the event, where Krishna reportedly asserted that the legendary MS had to transform herself into the ideal brahmin woman to receive wider acceptance, has generated a storm of heated opinions online. In his speech, Krishna reportedly said that MS had to distance herself from her family in order to embrace brahmanism, and argued that this transformation was also visible in her music. “One can hear MS Subbulakshmi’s old songs on YouTube. The music is free-spirited and electrifying and one feels like one is listening to a rock star. The music rendered by her after undergoing cultural and social transformation is equally fascinating to hear, but one notices the sorrow behind her voice,” Krishna reportedly said. He also reportedly asked if MS would have been as adored if she was dark-skinned and dressed differently. The response to the report has been a widespread wave of outrage, as numerous people have accused Krishna of hitting out at a dead icon to publicise himself and indulging in ‘brahmin bashing’. Chennai-based musician Anil Sreenivasan, for instance, said that there were more pressing issues to deal with, before talking about casteism in classical music. “As musicians we need to be cognizant of the fact that origin, caste, creed are man-made and short sighted aspects that we are all overcoming in the movement of time. To rake these up is unnecessary,” Sudha wrote in her Facebook post. “What is the Intellectual’s fixation about color? What skin type is he? Does he acknowledge that he is earned his status as a musician by virtue of his hard work? Or is it because he is Brahmin & Fair?” Malavika wrote in her post. Krishna’s statement regarding skin colour and appearance, in particular, have touched a nerve, with many throwing up examples like violinist T Chowdaiah, singer KJ Yesudas and others as counter-examples. Many also compared him to Kamal Haasan, who has recently faced the heat for his statements on ‘Hindu extremism’. Waves of vitriol have also come Krishna’s way, with many calling him senile, publicity-hungry and hypocritical. However, some sections of artists have also hit back at Krishna's detractors, accusing them of vitiating the debate further. Nrithya Pillai, a dancer from a nattuvanar/ devadasi lineage, for instance, said in a statement to TNM, "As an apolitical person who has shed her communal garb, but understands and respects the struggle and social oppression undergone particularly by women from the isaivellalar community ( to which I belong), I believe that TM Krishna has not disrespected or denigrated Madurai Shanmugavadivu Subbulakshmi. I have written her name in full for a reason, she wasn't shying away from keeping her mother's name as her initials and hence was open about her ancestry.My perspective of the article is that he merely questions if the same appreciation and celebration of her would have been meted out if she hadn't portrayed herself the way she did after her marriage . One can disagree with his views but to somehow make it about disrespecting M.S Subbulakshmi and making responses that actually put down another community or to have misconstrued facts written is not in good taste. No one needs to be ashamed of belonging to a particular community." To embrace Brahminism she distanced herself from her brother and family in Madurai and that is the sad part, Mr Krishna said. Hyderabad: M. S. Subbulakshmi’s music was truly mesmerising, but her life story was a tragedy, observed Ramon Magsaysay Award winner and celebrated Carnatic music vocalist T.M. Krishna. Coming from a Devadasi background in Madurai, Subbulakshmi tried to distance herself from her roots and transform herself into the ideal Brahmin woman so that she could be accepted in society, he said. The transformation could be easily identified if one listens to her songs of the 1960s and ‘70s, and later, after she ran away from her home to start a new life in Chennai. T. M. Krishna was speaking at Manthan on Culture and Community, at the inauguration of Manaku Teliyani MS, the translation into Telugu by reputed Telugu writer Volga of TJS George’s book on Subbulakshmi. “One can hear M. S. Subbulakshmi’s old songs on Youtube. The music is free-spirited and electrifying and one feels like one is listening to a rock star. The music rendered by her after undergoing cultural and social transformation is equally fascinating to hear, but one notices the sorrow behind her voice,” he said. He pointed out that art and culture should help us de-baggage ourselves and our identities to create interesting and equal communities. Culture and community are the two most discussed words, but great cultures are the ones that do not create a rift between insiders and outsiders. Mr Krishna posed a question to the audience: would they have adored and liked Subbulakshmi’s songs if she had been dark-skinned and dressed differently? Upper caste communities owned her because she looked fair and dressed like them. 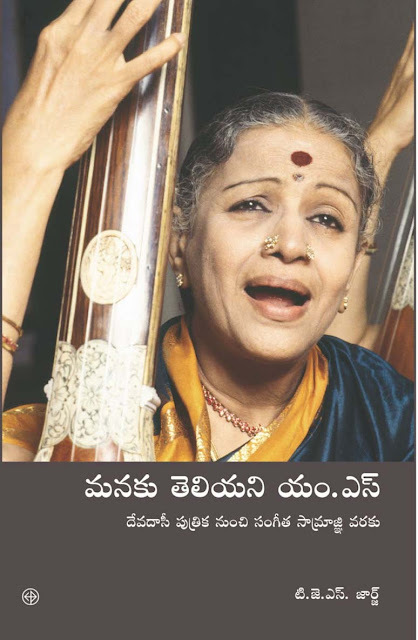 Telugu writer Volga said that she did not know much about Subbulakshmi or Carnatic music before translating the book. She found it strange that Subbulakshmi’s life was narrated in English by TJS George, and that it explained the role of religion, caste and language and the prejudices of a Brahmin-dominated male chauvinistic world and was not translated into many regional languages. Perhaps the community did not want Subbulakshmi’s true identity and background to be revealed to the next generation, she said. Bharat Ratna MS Subbulakshmi, the Bhakti Yogi! Instead of celebrating the awe-inspiring life of a woman who soaked herself in the Bhakti of her music leaving behind a monumental volume of work for several generations after her to cherish...here is a fellow artist who chooses to intellectualise her life, not through her music but through the eyes of a translator who admits, knew zilch about her subject before she commenced writing! Does the music world require to listen to an “intellectual” like him, who chooses to speak instead of sing which he knows best, I wonder?! He chooses to reiterate her Devadasi origin which was long forgotten even during her times & almost mocks at her serene presence that characteristically came through in her choice of sarees, the manner in which she draped them & her shining nose-studs. The carefully combed locks, curled beautifully like many a heroine of her times. I for one, have attempted that look so many times when I played a traditional character in films. Mr.Intellectual may google to find out how, MLV & Balasaraswati of her times too dressed similarly much like their predecessor “Devadasis”. Rukmini Devi, who was Brahmin Mr. Intellectual, whose life was dedicated for the cause of renaissance of Sadir also dressed similarly. So, MS Amma dressed no differently from them, “to look Brahmin” as imagined by the Intellectual & if anybody it’s him, who needs to de-baggage himself from the imagined sorrow behind the Bharatratna. All of us human beings, more certainly artists are sensitive & hence emotional but choose to swallow the bad in our lives only to draw, render the best to the world. That’s but natural for any artist...but am amazed at the insensitivity of the Intellectual who digs,analyses & recites unverifiable facts from the life of a great soul, posthumously. Speaking of Culture,the least one can offer any human being is to not speak of his/her personal details in a public forum after their death & in this case, about a woman whose voice plays to usher the day & the deity at the most visited temple in Tirupati. Let’s remember that Just a few months ago, the nation celebrated her birth centenary ...but was it because she was a Brahmin imposter & fair? And may I ask, what is the Intellectual’s fixation about color? What skin type is he? Does he acknowledge that he is earned his status as a musician by virtue of his hard work? Or is it because he is Brahmin & Fair? No, I won’t check the caste & color of the originators of Samaveda, from where the the intellectual’s music was derived. But the religion unfortunately for him is Sanatana Hindu Dharma, no Sir, no luck there. Carnatic music came to be, as a means to transcend the mortal, propounds evolution to super consciousness & uses Bhakti as a tool. That is perhaps what she did too...simply immersed herself in her music to take herself & her Rasikas to the sublime instead of attempting to intellectualise her Art! Our Intellectual may not like Hindu but Dharma he must follow, his Dharma as a musician is to sing & be respectful of senior artists. Swadharme nidhanam shreyah paradharmo bhayapahah says Krishna, the Lord, not the Intellectual...who recited it in the ‘Song of God’, Bhagavadgita. And no, He was neither Brahmin, nor fair. Perhaps now the intellectual needs a name change! Criticising TM Krishna should not mean denying MS Subbulakshmi’s devadasi roots and forgetting the community's contribution to dance and music. TM Krishna’s recent comments on MS Subbulakshmi has led to a series of reactions from the Carnatic music and dance fraternity. The reason I write this is not to approve or disapprove of TM Krishna, but to comment on the effect those reactions have had on me, a non-Brahmin Bharathanatyam artiste who comes from the isaivellalar community and is trying to make a mark for herself in the Bharathanatyam arena. In the wake of this controversy, we have had a battalion of artists posting “I am a proud brahmin”, with hashtags and other statuses proclaiming their pride in their community. It made me wonder if my community, the devadasi/isaivellalars, could have done something similar several decades ago. Apparently, they couldn't. They were under tremendous social oppression and feared arrest if they sang and danced, or if they proclaimed themselves for who they were. The Madras Devadasis (Prevention of Dedication) Act and ensuing reforms wiped out a community whose women were predominantly the custodians of art, dance and music. Did the socio-political reform need the devadasis to stop dancing/singing? No. Reform was needed for the men to stop having polygamous relationships and marriages, and to prevent the social abuse of women. This reform could have been a universal one. Many who have spoken to members of the devadasi/isaivellalar community after the ‘reform’ suggest that these women and men felt dispossessed, displaced, helpless and bitter. I still feel that bitterness emanating from my people at so many different levels. The matrilineal community has long changed into one controlled by patriarchy. The nattuvanars came to the forefront and the women were banished into their households. You may ask, why didn't they fight back? Well, some tried. Their fight was about keeping the art alive, and it is, isn't it? Only, there are not many from the community who still sing and dance. Many women had to seek safety and protection under ‘socially acceptable’, ‘respectable’ marriages, and some in education and other livelihoods. The socio-political scenario during this time and what happened to these custodians of art is one of the least addressed topics in the world of the dance and music. After TM Krishna’s statements became the talk of the Sabha fraternity, Facebook saw several responses to it, including some #iamaproudbrahmin posts. One post suggested that MS Amma’s father was a brahmin, and hence, as the father's caste is the one taken into consideration, she was indeed a brahmin. (The devadasis were matrilineal and MS stands for Madurai Shanmugavadivu.) Quite contrary to what is being written, MS Amma was not ashamed of her roots. Also, her life and it's happenings were no big secret. Everyone can be proud of their community, but please don't put down another community, and that too without actually knowing its socio-political struggles. Many posts gave me the impression that the brahmins did not want MS Amma's past to be discussed, and that they would rather call her one of their own. Some posts suggested TM Krishna had suggested that MS was a brahmin imposter - which is, again, a matter of perception. Every aspect of her personal life has been written about before, both as articles and in her biography. She wore a Madisar, and everyone knew it. One post questioned why casteism in the music world is being raised as an issue when there are so many other important social issues. But shouldn’t the wiping out of an entire community from the arts scenario be an issue of importance? How can it be conveniently forgotten? What was TM Krishna really asking? In my understanding, he was asking if the sabha fraternity would have been as accepting of her if she hadn't portrayed herself the way she did. Some responses said the arts world is indeed inclusive. But often I don't understand why this response is justified with examples from the past. Yes, we can all talk about Brinda and Mukta, and the legendary Balasaraswathi. But what about after MS Amma? Do we still have iconic celebrities from the isaivellalar community in the music world? Is the nadhaswaram-tavil kutcheris part of mainstream Carnatic music? The Madras Music Academy hosted artistes from the devadasi communities like Kumbakonam Varalakshmi and Banumathi, and the legendary Balasaraswathi in the 1930s. Do we have dancers from the community representing Bharathanatyam in reputed Sabhas today? A level playing field in the arena of classical music and dance is the need of the hour. One need not subscribe to TM Krishna’s views, it is one's right to disagree. I myself will agree that the way the issue has been articulated is problematic and do not agree with him on several notes. But saying that he somehow ridiculed and passed denigrating comments on MS Amma and her music is barking up the wrong tree. Even if he is indeed doing this with an agenda (political or otherwise), I do think it has paved the way for dialogue and debate, which is required for the betterment of any field. Yes, dancers and musicians need to be able to articulate on issues besides just being able to sing or dance. For those who have problems with his statements, do address them. If you feel it is Brahmin-bashing, go ahead with your criticism. But do not put down another community or section of people. No one has to be ashamed, but the dialogue need not take a regressive approach. Be empathetic and kind, don't make people from other sections in the art world feel cornered. We have already undergone a lot, and carry the baggage of the social oppression of our ancestors. The only way we can shed the baggage is if everyone feels welcome in the arena of the arts. I hope someday everyone in my community can feel the same way. I am proud of my lineage and the community I belong to. I am proud of the women who sang and danced, the men who held the cymbals (and also the few women who held the cymbals, which was against societal norms back then), and the men and women who were part of the periya melam and chinna melam. And I shall forever try and aspire to be a "nayika from the padams". And I would like to believe that any woman who chooses to live her life on her terms, who exercises her right to choose a partner of her choice, who chooses to wear what she wants – be it the madisar or a short skirt – who propels herself in her chosen profession and surrounds herself with positive people who celebrate her and form a support system, is intelligent. That is the only way to face patriarchy and hypocrisy. We should celebrate such women. Nrithya Pillai is a dancer from a nattuvanar/devadasi lineage.